Although there are thousands of egrets, cormorants, frigates and pelicans in my neighborhood, today one lone cocoi heron stood guard in front of the riverhouse. Thanks, neighbor! Incongruous – adj – 1. Not corresponding: disagreeing 2. Made up of diverse or discordant elements. 3. Unsuited to the surroundings or settings. Congruent – adj. 1. Corresponding: congruous. Congruous – adj – 1. /Corresponding in nature or kind. Roosting egrets streak home in low light! Equally elusive is the lone Cocoi Heron, a pearl of a recluse that dodges society. At times this feathered beauty stands guard in the mud flats upriver, or it edges closer to the ibis and egrets that forage beneath the blue-green mangroves. Quite shy and untrusting, it soars away at the slightest hint of human presence. Today, however, this closest neighbor of mine stood guard slightly downriver from the house while rough-winged swallows flitted nearby! Gazing out the other windows, I’ve observed a different scene for over a month. I’ve briefly mentioned this new activity, though I’ve tried to dismiss it; this daily intrusion sometimes lasts into the night. What’s the loss of a few more mangroves to a monster-eating machine? Would you describe the two views as incongruent? One side immerses one in nature; the other represents chaos. January 09, 2014 – One week after devastating high tides assaulted nearby El Matal… How did this work rate more important than the crisis at El Matal? One month later, the tides attacked again. The tide charts warned of these spring tides, yet the year-long pleas for help failed to get assistance. View from the far side – before work began! Shrimp Harvest: CLOSE THE GATES! I mourn the loss of this lovely mangrove tree, removed in 2012 in phase one of mangrove destruction! Accelerated erosion began after the loss of the trees. Its surviving siblings bit the dust (mud) last month when the new ‘bridge’ work began. Today’s view – (They poured concrete during the night) – wonder where they get their sand? Strong enough for a 747 touchdown! Beneath the chaos are the public waterlines. Wonder why the water isn’t reaching the meter? It’s a bit incongruent that this project warranted more importance than the vanishing beach at nearby El Matal. 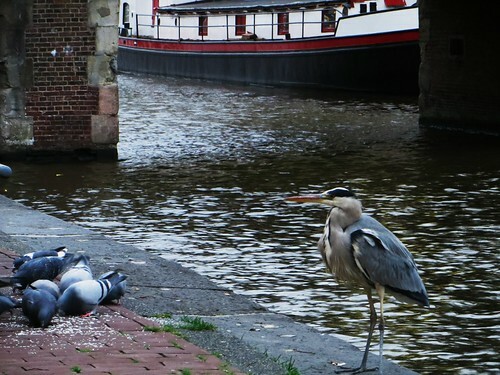 After surrendering to the no-water blues, I tweaked my view back to the river and its self-appointed guardians. Sigh; the incongruent view negated my stress, and I left my troubles at the roadside. Subtle waves rolling upriver suggest stronger breakers on the coastline. The river ebbed higher, and subtle rolling waves tipped upstream and smacked the usually-quiet riverbank. The cocoi heron clocked out for the day, and the night herons began their nocturnal shift. The waves suggested that the ocean was building strength. I thought of my friends, several miles on the other side of the river, filling sandbags and preparing for the next aguaji. How can one not sleep well when watched over day and night by the feathered guardians? Thank you so much! The birds are my angels, watching over this quiet bend of the river! i wish i were there with you! hey, i’ll unlock the bodega doors, grab some fresh shrimp and will head that way on the magic carpet! are all of you ready for a ride?!!! Hoping El Matal receives an army of guardians, soon. What the heck are they building? I don’t understand it. It looks like a bridge? thanks amiga.. yes, that’s a bridge.. i was told last year that there had been no approval for a new road through this area, but this is the second bridge along this quiet untouched route. i think that sometimes people think that ‘improved’ is better, but it taints the refreshing simplicity – what brings tourism to new areas.. another highway would be redundant, as they’ve just spent years improving one that parallels this several miles inland! It’s amazing how calm the heron is, considering the activity near by. I wonder if it is studying the new water flow and water discolouration and trying to work out how to find food in an altered environment. I would find that stressful. 😦 I don’t even like it when the supermarket rearranges products on the shelves! so it’s daylight here,and the ocean is sending a new set of waves upriver, but they are more quiet. the songbirds are singing their hearts out. is it going to be a good morning? yours is finished; whatever happened over there will surely follow here! Birds keeping cool whatever happens. you are so right — thanks! There was a group of environmentalists here about a year ago checking out the beach. When asked they said that they were evaluating the erosion of the beach. Haven’t seen them back nor anything being done to protect the shoreline. We are losing sand (beach) here in San Clemente poco o poco. Love the photo of the Cocoi heron. Are they night birds? We’ve been hearing a new call at night but have yet seen the beauty who is serenading us. most of the sweet songs come from the nearby branches on the yard – swallows, wrens, blackbirds, mockingbirds. the foliage here has become so dense, it’s hard to see any ! i wish those people would return! please point them n our direction if they do! Very cool! You are in good hands (as it were) with a guard like that! Although I adore the images of your birds, my heart aches for what is going on with the erosion of the beach. Interesting – the cocoi looks amazingly like our black-crowned night heron when it’s all tucked up. I see that it actually has more in common iwth our great blue. They’re wonderful birds. The great blue also is solitary, and also rarely makes a sound, except when disturbed. Then, it gives out great, racous squawks. Perhaps if you all take a clue from the cocoi and keep squawing, something will be done to make progress less destructive, and prevent unnecessary damage. And yes – I noticed that truckload of sand. Left hand ignoring what right hand is doing, perhaps? yes, i think they started on the same assembly line, the n switched makeup artists at the end!!! Incongruent is one word. I can think of some stronger ones. Thanks for sharing. yes, i try not to let that thought cloud get to dark, but it’s often easy to surrender to the frustrations! thankfully i have a balance, and the flip side is my saving grace! even if they do plan to replace the gravel road with a highway, it doesn’t seem to be more important than saving a seaside village! I’m sorry this is happening, Lisa. they´ve finished pouring hte concrete, and hopefully the area will recover fast. yes, the view is so sweet, but four years ago there were mature mangroves ´downriver´from the house.. now they´re gone, replaced by huge boulders to ´strong arm´the river. DingDingDing! I wanted to be sure and get this where you would see it. I just heard an ad on the radio about the scourge of “patent trolls”. My ears picked up immediately. Seems they’re everywhere these days, and that’s exactly what happened to you with that “sonrisa” business. Here’s a link to a brief intro at the Electronic Frontier Foundation website: Patent troll victims. A google search will turn up all kinds of stuff, including a wiki, examples, etc. etc. I’ve never heard of them before, but clearly their presence is becoming more of an irritant. The good news is that what happened to you has a name, and you’re far from alone. wow; thank you so much! with a sigh of comfort and a sparkle of a tear in my eye, i am comforted to know that for every hundred selfish people in this world, there is one with a code of honor, a fierce spirit, compassionate sensitivity and a strong backbone. you don’t just say, ‘oh that’s too bad,’ and move on; you remember what number is beneath each card — what WAS the name of that memory game, btw? some drink at the well of knowledge, and others shun the wisdom passed on by others who learned those lessons the hard way. it’s discouraging to witness teh closed-mindedness while others suffer. with each sunset, we’re closer to tne next aguaji/high tide, one that we’re all dreading. i’m glad you like the birdlife – it’s almost sunset here, and of course the river is quiet and peaceful. I feel bad for the wildlife. You can almost see the sadness. Lovely heron standing guard. i tried for hours to get to your post today, and the slow internet would not open the page! Oh, my that is not what should happen. Thank you so much for visiting. Lucky I can visit you much easier.